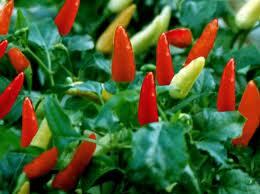 Capsicum frutescens plant named Latin consists of three varieties. First, cengek leutik: Small fruit, green, and stood upright on the stem. Second, the type cengek sheep (cengek Bodas): The fruit is bigger than cengek leutik, white, and becomes orange when ripe. Third, ceplik: The fruit is big, green, and to red when old. Based on the theoretical treatment of Traditional Chinese Medicine (TCM), a plant named La jiao China has a spicy flavor, its hot, and enter the heart and pancreas meridian. According to Dr. Sugiarto Budi Widjaja, TCM, Clinics of Beijing, Jakarta, red chillies efficacious as a powerful tonic and stimulant for the heart and blood flow, as well as rheumatic drugs. Cayenne pepper mill to destroy a blood clot (anticoagulant) and cope with rheumatic disorders and frostbite. Cayenne can increase appetite (stomakik), stimulating the skin, laxative fart (carminative), and sweating bullets (diaforetik), saliva, and urine (diuretic). According to Dr Setiawan Dalimartha, members of the Center for Development and Application of Traditional Medicine (SP3T) DKI Jakarta, in the cayenne fruit contained capsaicin, kapsantin, carotenoids, volatile alkaloids, resins, oils evaporate, and vitamins A and C. Provide a sense of spicy capsaicin in chili peppers, efficacious blood flow as well as numbing the skin. Seeds of plants named region lombok jempling (Madura), chili (Java), leudeu needle (Gayo), smooth rica (Manado), metrek wakfoh (Papua), said Dr Setiawan, contain solanine, solamidine, solamargine, solasodine, solasomine, and steroidal saponins (kapsisidin). This last Gynecology efficacious as antibiotics. When eaten, spicy taste on the tongue may cause stimulation to the brain to release endorphins (endogenous opiate). As a result, the pain disappeared and the resulting feeling healthier. In the reproductive system, its heat can relieve tension and pain from poor blood circulation. One of the results of research, said Dr. Setiawan, cayenne pepper is known to have efficacy to reduce the occurrence of blood clotting (thrombosis) and reduce levels of cholesterol. One more thing, many contain antioxidants (like vitamin C and beta-carotene), can be used to overcome infertility (infertility), an aphrodisiac, and slow the aging process. The problem is, not everyone can consume excessive cayenne pepper. People with sore throats, sore eyes, and patients with digestive tract disorders, said Dr. Setiawan, is not advisable to consume cayenne pepper. Research conducted Tyas Ekowati Prasetyoningsih from the Faculty of Pharmacy, Airlangga University, East Java, in 1987, mentions, cayenne pepper fruit extracts had inhibition on the growth of the fungus Candida albicans, the fungus on the skin surface. The inhibition of cayenne pepper 1 mg / ml equivalent to 6.20 mcg / ml nystatin in Formamide. Dr Setiawan added, chillies indications are used to increase appetite, normalizing the feet and hands are weak, comforting feeling of nasal congestion on sinusitis, reduce cough with phlegm, and relieve migraine. There are several ways you can do to get the benefits of cayenne pepper. Can be boiled or made by powder and pills. For external use, enough to boil, then steam is used heat the body of the sick. Another way, says Dr Setiawan, by grinding cayenne pepper until smooth, then splash it on the affected part. This last mode can be used for rheumatic disorders and frostbite (pain due to cold finger). Leaves can be milled to smeared on diseased area in order to cope with abdominal pain and ulcers. 15 cayenne pepper, 1 / 2 teaspoon of whiting, 1 lime Usage: Chili pepper until finely ground, halved lemon, take the water. Mix the chili pepper mill, betel leaf, and lime juice, stirring until blended. The concoction smeared on the body of the sick. Do it until the disease cured. 15 g young leaves cayenne pepper, 1 / 2 teaspoon whiting Usage: Wash the leaves of pepper until finely minced. Add whiting, stir until blended.Concoction smeared on the belly of the sick. Do treatment 1-2 times only. 2 cayenne pepper root weevil, 15 pairs of chicken paws, 60 g peanuts, 6 grain hungcao Usage: Clean all the ingredients, then cut into pieces as needed. Add water and wine as much to materials submerged approximately 1 cm above it. These ingredients cooked by steamed. Once cool, strain the water, drink twice a day, each half of the potion. Remove seeds chili pepper, minced until smooth. Smeared into the affected part.